Hello Everyone! Monica here! So I'm back with another project for you. 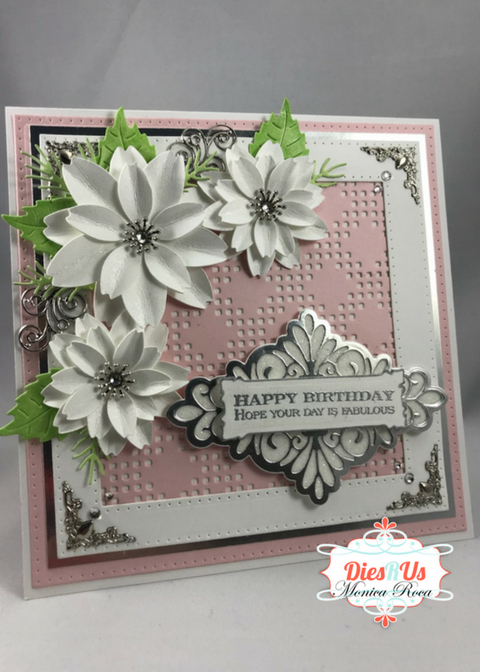 Today's project is a Birthday card. I used various dies, which will all be listed below to complete this card which is jam packed full of die cut goodness. A quick note the flowers created were made from items in my stash but I have linked a die below which can help you make a similar flower. Here is my YT Video where I go over the products used as well as the details of the card. AWESOME! This is so pretty Monica ... love those flowers! Just beautiful and wonderful inspiration! This is just so gorgeous. STUNNING! Love what you have done with those flowers.